Your daughter is blossoming into a beautiful young woman, what better way to celebrate her than with our 'Faith is Blooming' Quinceanera invitation. 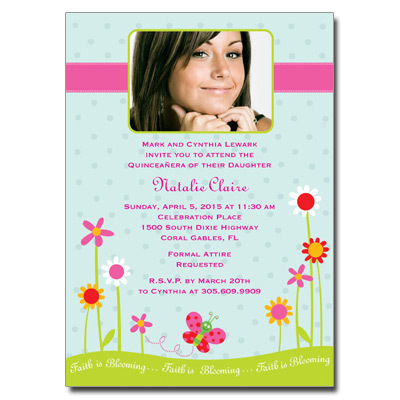 This design features your daughter's photo on a light blue polka dot background with pink font and ribbon motif. Flowers in pink, red, white and yellow spring up from the bottom of the invitation along with the words, 'Faith is Blooming.' Card measures 5x7.